Most students start elementary school and are engaged from the get-go, and that number slips significantly over time as students progress through school. So what can we do do ensure that our students don’t follow this national trend? 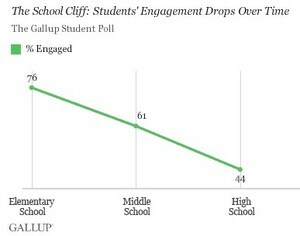 Students who maintain strong engagement levels share common attitudes toward school that we can learn from. For starters, students who are engaged in middle school agree with the following statement: Education has purpose and value to my life. These students are able to take a long-term view and connect education to future aspirations. They link success in middle school to attaining a high school degree, and even more importantly, understand that they will need to continue their education after graduation. It is extremely important for all students to know that most jobs require advanced learning beyond a high school diploma. Attending a traditional college, technical school, trade school, mechanics classes, or joining the military are all examples of post-high school options. Middle school is the perfect time to discuss these choices with students, and the adults in their lives need to emphasize the point that effort in middle school and high school sets them up well to pursue these options. Teachers at Escalante employ several strategies to build the belief that school has value with our students. In Crew, our students begin their Individual Career Academic Plan (ICAP) that they will continue to develop through high school. Additionally, we very rarely teach directly out of textbooks and aspire to craft lessons that have clear connections to real world issues. My hope is that every student at our school embraces the notion that school will have a meaningful impact on their futures - and there is no better time than middle school to make these discussions routine.